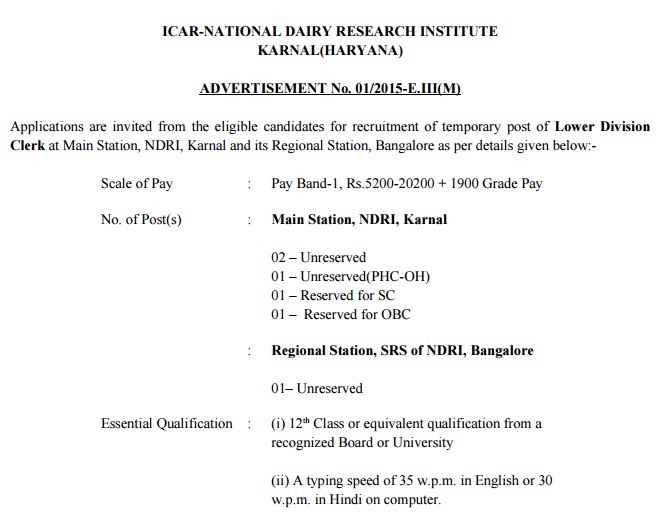 Five posts are for NDRI karnal and one post is for Regional Station, SRS of NDRI, Bangalore. Qualification-Senior Secondary/12th/10+2 pass from any recognized Board. Typing Speed-35 word per minute in English or 30 word per minute in Hindi on computer. No candidate will be paid TA for taking written/typing test. All posts are temporary but likely to continue. No correspondence will be entertained from any candidates for selection/appointment. Candidates are advised to send self attested copies of each testimonial in support of their qualification with their application form. Address for application-Senior Administrative Officer, E-III(M) Section, ICAR-National Dairy Research Institute, Karnal-132001. Application Fee-100/- rupees by demand draft in favour of “ICAR-UNIT-NDRI” payable at Karnal.No application fee for Woman/SC/ST/PH candidates of Haryana. Last date-The last date of application is 16.02.2016.